Facts about Darkling Beetles, "Scientific name for Darkling Beetle is Tenebrionidae". 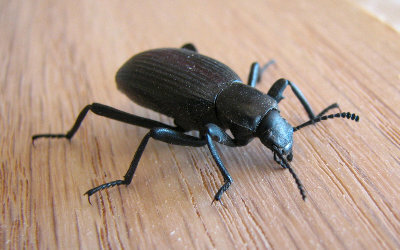 The darkling beetle isn’t a specific species of beetle, like the American oil beetle or banded longhorn beetle. Instead, the darkling beetle is a family of related species. J. B. S. Haldane, when asked he thought could be learned about the Creator from studying nature, he said that if God existed, he had an inordinate fondness for beetles; this is a reference to the sheer number of beetle species. And there are a lot of them. The order of insects, Coleoptera, is the order of beetles. Darkling Beetles are one family in that order. And there are at least 20,000 species in just the Darkling Beetle family. This species set is sometimes broken into nine sub-families. There are exotic species of Darkling Beetles in the Namib desert that raise their bodies to the morning wind to act as condensers, catching the morning dew to drink. Darkling Beetles eat fresh vegetation and decaying vegetation like fallen leaves. They are commonly pests in granaries, readily eating fresh seeds and drying grain. Some Darkling Beetles will eat feces and other dead insects. All 20,000 plus species of Darkling Beetles share a number of features. Darkling beetles have many-segmented antenna. They all have eleven segments on the antenna, though they may be clubbed, filiform, meaning leaf shaped, or moniliform, meaning it resembles a string of beads. The antennae usually arise from a ridge near the eyes. They have two abdominal sternites, and the first one is not divided by a hind coxae or leg. The second sternite is far larger than the first one. Their eyes are notched via a frontal ridge. Beetles have six legs. Their legs or tarsi have a distinctive pattern. The hind pair have four segments. The front legs and mid-legs have five segments. This species has simple tarsal claws. Most Darkling Beetles have hardened front wings. Their shapes range from round to squarish and rectangular. Their bodies may be globular or nearly flat. You really can’t tell males from females short of catching the female laying eggs or dissecting them. Darkling Beetles are eaten by almost everything, from birds to rodents to spiders to lizards. Darkling beetles lay white ages. Darkling Beetle larva, called mealworms, are eaten by insectivores. The mealworms thus aren’t true worms but darkling beetle larva; they are around an inch long. At this stage of their lives, they have a tough yellow or brown exoskeleton and are cylindrical. You can distinguish them from worms by their harder exoskeleton and the six legs and antennae at the front of the body. Another way to tell them apart is the fact that the mealworm molts, while worms don’t. It may molt ten or twenty times before building a shelter in which to change. The larva builds a pupa in which to mature. The pupa darkens right before the mature beetle emerges. Darkling Beetles are regularly raised to feed baby reptiles, amphibians and other creatures. The Eleodes genus of darkling beetles are called the desert stink beetle; they are more closely related to other Darkling beetles than the Halyomorpha halys, more commonly known as the stink bug.